The European postal organisation 'PostEurop ' adopted bridges as the theme for the Europa 2018 issue. The Post of Cyprus specially issued these stamps on 2nd May 2018 depicting the Kelefos Bridge and the Akapnous Bridge. 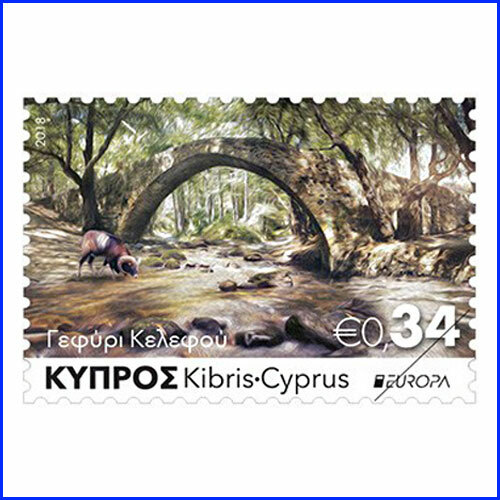 The above-shown stamp features the Kelefos Bridge suited in the district of Pafos surrounded by the beauty of vegetation and brilliant wildlife. This bridge is of Venetian origin construed over the Diarizos River, also known as 'barbarian'. This bridge is the biggest medieval bridge construct on this river. The second stamp featuring bridge Akapnous is located in Limassol district. This bridge was constructed during the Venetian occupation; its construction has remained unaffected and didn't change with time.